(London Post) The Higher Regional Court in Frankfurt has convicted a Rwandan national to lifelong imprisonment on genocide charges. The court determined that the accused had taken part in a massacre of hundreds of Tutsi in 1994. Onesphore Rwabukombe had already been convicted of genocide charges in February 2014, resulting in a 14-year prison sentence. But the Federal Court of Justice, Germany’s highest appellate court,rejected the original verdict, saying it had shown too much clemency in the face of the gravity of the charges against him. Rwabukombe stood accused of partaking in a massacre against Rwanda’s Tutsi minority which reportedly occurred on April 11, 1994. More than 400 Tutsi refugees were murdered at a church in Kiziguo, where Rwabukombe was mayor at the time. In his initial trial in 2014, judges had been unable to determine whether Rwabukombe had acted with the specific intention to commit genocide, or whether he could only be accused of complicity amid a general climate of hate. During the second trial, judges decided that Rwabukombe’s actions were indeed addressed against an entire ethnic group, and not just directed at a selection of individuals. This allowed the court to overturn the previous ruling and sentence Rwabukombe to life imprisonment without the possibility of parole under the genocide charges. The 58-year-old had refused to testify in the case against him, forcing judges to rely solely on circumstantial evidence, said Josef Bill, the presiding judge at the Higher Regional Court in Frankfurt. “This was an unimaginable blood bath. The accused stood there covered in a pool of blood reaching up to his ankles while he continued to give orders [to kill],” the presiding judge said. German authorities had refused to extradite Rwabukombe to Rwanda, fearing that on account of his crimes he would not be guaranteed a fair trial there. 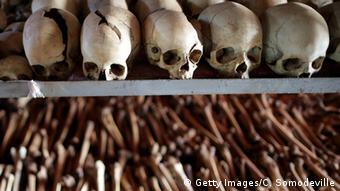 The verdict was the first of its kind handed down in Germany with regards to the Rwandan genocide. German law allows for courts in the country to prosecute individuals for war crimes, genocide and crimes against humanity even if these were committed abroad and by foreigners without a direct link to Germany. However, takingGermany’s involvement as a colonial power in Rwanda during the late 19th and early 20th centuries into account, the judges may have paid particular attention to the controversial case. Animosity between Hutus and Tutsi in Rwanda as well as in neighboring countries Burundi and Uganda had been rife for many years since the end of colonialism in much of Africa but escalated when President Juvenal Habyarimana’s plane crashed on April 6, 1994. The pivotal event was blamed on the Tutsi minority although circumstances surrounding the plane accident remain unsettled to this day. Killing squads were mobilized immediately after radio broadcasts started to call for the annihilation of Tutsis. The quick succession of events seemed to imply that the Rwandan genocide had been planned and coordinated before the president’s death. Within the course of only a few months, Hutu extremists killed at least 800,000 people in Rwanda – mainly the minority Tutsi as well as some of their Hutu sympathizers and supporters.